Using rel=author or rel=publisher, Link to your Google+ profile using rel=”author”. Among the most frequently-asked questions we get at the Google Authorship and Author Rank Community on Google+ are those concerning the usage of rel=authorship and rel=publisher connections. As Google develops and becomes increasingly “personalised”, we take a look at Google Authorship mark up. By using rel=”author” and rel=”me”, you can enhance the way the SERPs display your content and put your name and face to your work – the photo is taken from your Google+ profile. There are, of course, plenty of “how to” guides on the topic but even the official Google guide is over-complicated. 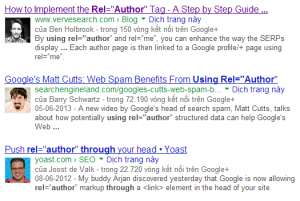 This will help you add Google authorship markup, quickly and easily. inking your content to your Google profile is a two-step process. First, you add a link from your website or page to your Google profile. Second, you update your Google profile by adding a link back to your site. Your link must contain the ?rel=author parameter. If it’s missing, Google won’t be able to associate your content with your Google profile. The second step of the verification process is to add a reciprocal link back from your profile to the site(s) you just updated. Or to put it another way, should your site have an Authorship connection to Google+, a Publisher connection, or both? And for what is each intended? To what parts of your site should each be applied? – You qualify to have your Google+ profile photo show next to search results for your content (the Authorship “rich snippet”). – You will likely get a higher-than-normal click-through rate (CTR) for authorship snippet search results lower than the first result on a search page. – an excellent study by Justin Briggs. Possible protection against being outranked in Google Search by those who scrape your content and republish it on their own sites. – The (future) possibility of gaining “AuthorRank,” a boost in search results for your content in topics for which you become recognized on the web as an authority. What Is rel=publisher (Google+ Verified Publishers)? – Qualifying for a check mark next to your brand page name on Google+, which lets Google+ users know that this is the official, verified page of the associated brand name. This is important as anyone can start a page with your brand name (i.e., there are no unique names on Google+). – Allowing Google to aggregate your +1′s to amplify your count. If you have a verified connection for your brand page, the +1 count displayed on your brand page will be a combination of followers of that page, +1′s given to the page directly, +1′s on your web site, and the total membership of any Google+ communities owned by your page. In addition, if you connect your AdWords account to your Google+ account, and enable the social extensions in your AdWords campaigns, your +1 count may show up on your AdWords ads. – The possibility of getting a “knowledge panel” result for branded searches on Google Search. See illustration at right. This doesn’t display until your brand page builds up a certain amount (how much we don’t know) of engagement on Google+. It shows prominently in the right panel of search (replacing ads) and displays your logo, the name of your G+ brand page, the number of followers you have on Google+, a Circle “chicklet” that allows people to add your page to their Google+ circles right from the search page, and your most recent Google+ posts. Beginning a few months ago, Google began displaying an example of such a result in their Structured Data Testing Tool for verified brands. Below is an example. Remember, this is not yet actually showing up in search results. The most confusion about these two connections seems to be around where each should be applied to a site. Are both useful for an entire site or only on specific content or pages? Let’s start with the easiest answer. rel=publisher is for your whole site. Add a Google+ Badge to your home page. This has the added advantage of making it easier for visitors to visit your page or add it to their circles right from the badge. Create your own link from your site to your Google+ brand page (be sure to include a rel=”publisher” tag in the link). Hide a link in the header of your site, using the format <link href=”GooglePlusBrandPageURL” rel=”publisher”> (where obviously you substitute your page’s URL for GooglePlusBrandPageURL). If your Google Webmaster Tools email address is the same as the Google+ profile address you used to create your brand page, then verification may take place automatically. Again, it’s important to understand that rel=publisher is a “once for all” connection to be made between your web site and your Google+ brand page. You do not need to do rel=publisher markup on specific pages of your site for it to work for you. And don’t forget to link to your web site from your Google+ page “About” section! That’s necessary to establish the two-way verification for Google. rel=author (Authorship) is for original content by real people. Google’s intention for Google Authorships is to help identify and make a connection between real persons who create content and their content across the web. That’s probably the major reason why Google held off on making any big deal about Authorship until after Google+ was unveiled. Google+ makes it easy for people to create self-identifying Google profiles, and to connect those to the places where they post original content (via the “Contributor To” link section in their profiles). Therefore, ideally a rel=author connection should be made only between original pieces of content clearly authored by someone with a Google+ profile and those author’s Google+ profiles. Alternatively, if you have multiple authors on your site and each one has his or her own author profile on your site, and their content on your site is linked to their site profiles, then you can just create a rel=author link from each of their site profiles to their respective G+ profiles. Make sure they each link back to your site or their site profiles from the “Contributor To” link sections of their Google+ profiles! Can I Apply Authorship to My Whole Site? It creates bad user experience. People are getting used to associating authorship rich snippet results with rich content by a real person whom they can trust. Landing on a product or FAQ page probably creates disappointment, and may increase your bounce rate. It may actually lower your CTR for some pages. I have heard from ecommerce site webmasters who were pretty certain their organic traffic actually went down if they were able to trick Google into showing an authorship snippet for product page results. This may be because people searching for a product find a face photo disconcerting, or even off-putting. It just doesn’t belong, so they ignore the result. Based on the prior two reasons, I believe that if and when Google starts using Authorship as a direct ranking signal for search (the much-talked-about “AuthorRank”), Google will find ways to downgrade or even penalize Authorship used improperly. Google reps have said repeatedly that the intention of Authorship is to help people connect with topically-rich content by recognized real authors. That being said, is there ever a time when it is okay to connect Authorship to a whole site? Yes, and this was confirmed by Google’s Matt Cutts during an “Ask the SEOs” session at SMX Advanced 2013. Matt said that for personal sites, such as your own blog, where you are the only author, it’s fine to just connect the entire site to Authorship (you could do this by just putting a rel=author G+ profile link in your site’s header). In fact, he does that for his own personal blog. In addition, Google actually offers a simple method for verifying Authorship via your email address. We should Use Google Webmaster Tools?